Lee Woolery|Miami Valley Today Troy starter Ethan West delivers a pitch Monday against Miami East at Miami East High School. Lee Woolery|Miami Valley Today Troy’s Cole Brogan follows through on a double Monday against Miami East. Lee Woolery|Miami Valley Today Miami East’s Ian Gengler pitches Monday against Troy. Lee Woolery|Miami Valley Today Miami East’s Austin Francis lays down a bunt Monday against Troy. Lee Woolery|Miami Valley Today Troy’s Braeden Snider follows through on a hit Monday against Miami East. Lee Woolery|Miami Valley Today Miami East left fielder Gage Butz fires to home plate Monday against Troy. Lee Woolery|Miami Valley Today Troy’s Austin Kendall can’t come up with the late throw as a Miami East runner steals second base Monday. Lee Woolery|Miami Valley Today Miami East shortstop Tyler Kirby throws to first for an out Monday against Troy. Lee Woolery|Miami Valley Today Miami East third baseman Hunter Gross throws to first base Monday against Troy. Lee Woolery|Miami Valley Today Miami East’s Garrett Lemaster pitches Monday against Troy. Lee Woolery|Miami Valley Today Troy’s Matt Bigley recorded a save in relief Monday against Miami East. 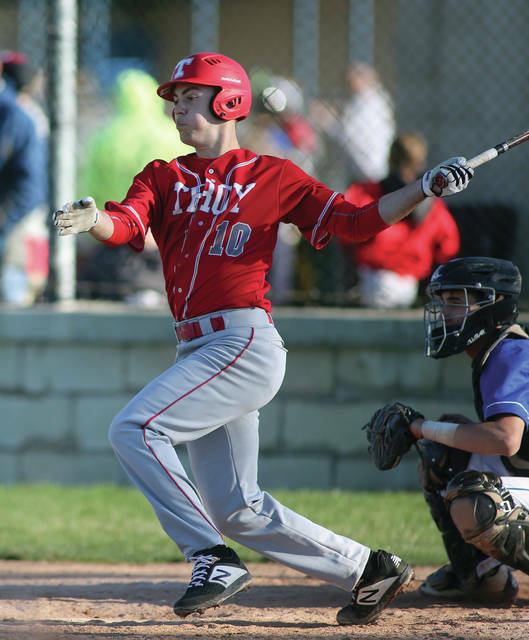 CASSTOWN — After two straight narrow defeats, the Troy baseball team needed to get back track. Miami East wasn’t about to make it easy, though. 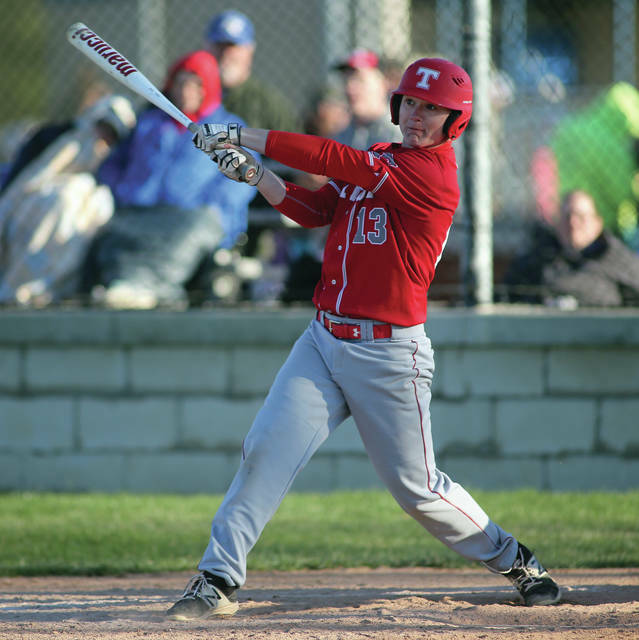 Still, thanks to another solid outing by starting pitcher Ethan West and an explosive day at the plate by Cole Brogan, the Trojans snapped a two-game losing streak, topping the host Vikings 4-1 Monday at Miami East High School in non-league action. 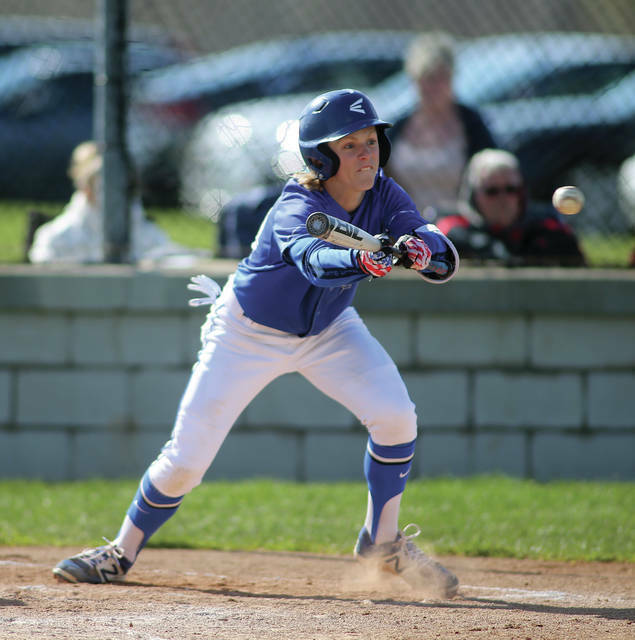 And while the Trojans improved to 8-3 on the season, Miami East — which split a doubleheader against a quality Madison team on Saturday and entered the game having won four of its last five games — fell to 7-8 on the year. In the end, though, Troy’s West turned in yet another solid Monday outing — only this time he got credit for it. Two weeks ago, he had to watch the bullpen be unable to hold a lead in a 4-3 loss at Greenville, and last Monday he left the game before the Trojans rallied in the seventh to claim a 4-3 win at Sidney. Monday, West was on his game yet again, pitching six innings and allowing only one run on three hits, three walks and a hit-batter while striking out nine. Matt Bigley pitched a one-two-three seventh, striking out two to earn a save. And this time, West got run support from the start, too. In the top of the first, Brogan ripped a one-out double to the deepest part of the field in center and moved to third on an infield single by Jacob Adams. Braeden Snider then hit an RBI sac fly to center, putting Troy on top 1-0. And in the second, Sam Shaneyfelt reached on an error to lead off, Nathan Henderson walked, both runners moved up on a wild pitch and Grant Gariety drove in a run with an RBI groundout to make it a 2-0 game. Brogan finished the game 3 for 4 with two doubles, a run scored and an RBI, driving in pinch hitter Luke Severt with a two-out single for an insurance run in the sixth inning that gave the Trojans a 3-1 lead at the time. And the Trojans cashed in a leadoff double by Snider in the top of the seventh, with Bigley ripping a two-out RBI double down the third-base line that made the score 4-1. Still, it wasn’t a great day for the Trojans at the plate, as they left a total of 11 runners on base — nine of those in scoring position — and left the bases loaded twice. Adams was the only other Trojan with multiple hits, going 2 for 4. Miami East got its run in the second inning. Gage Butz drew a walk to lead off, and a hit-and-run single by Hunter Gross put runners on the corners with no one out. Jonah Wolf hit an RBI groundout to cut Troy’s lead in half to 2-1 at the time, but West buckled down and got out of the jam — and a few more on the day, too. 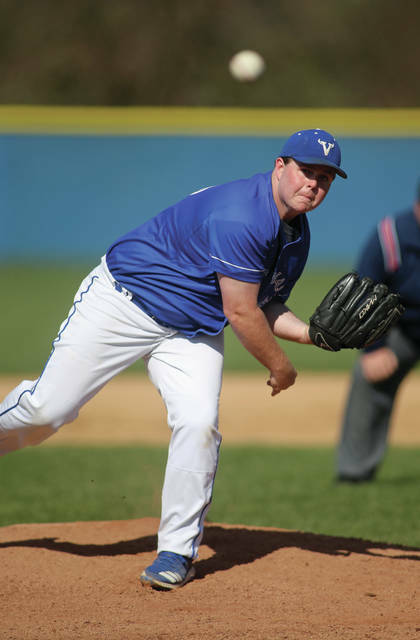 Of the nine runners the Vikings left stranded, six were in scoring position, and West worked out of a bases-loaded jam in the fifth inning with no damage done. Alex Hayes had the Vikings’ lone extra-base hit, a double, an none of the Vikings had multiple hits on the day. Starting pitcher Ian Gengler pitched well, allowing two runs, one earned, on four hits and two walks while striking out six in four innings, Hayes pitched two innings and allowed one run on two hits and three walks with one strikeout and Garrett Lemaster allowed one run on two hits and a walk with one strikeout in the seventh inning. “We had a couple of squeeze opportunities that we didn’t perform on, a couple times we weren’t focused. But the kids have been working hard, and they’re getting better every day,” Denlinger said. Troy returns home to host Centerville in another non-league game Tuesday, while Miami East travels to Covington for a Cross County Conference matchup Tuesday. https://www.dailycall.com/wp-content/uploads/sites/30/2019/04/web1_041519lw_troy_ethanwest.jpgLee Woolery|Miami Valley Today Troy starter Ethan West delivers a pitch Monday against Miami East at Miami East High School. 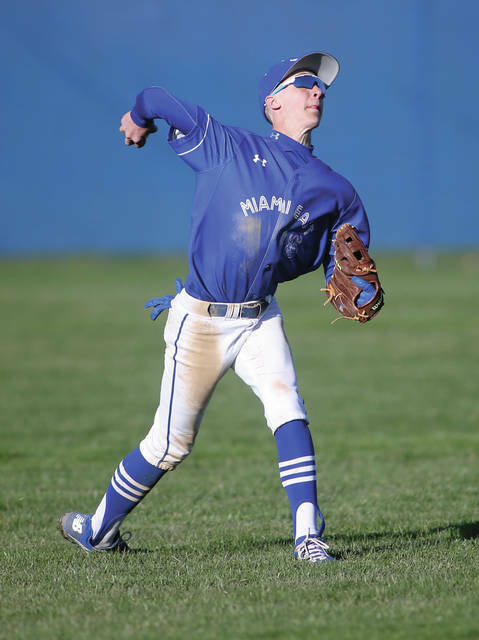 https://www.dailycall.com/wp-content/uploads/sites/30/2019/04/web1_041519lw_troy_brogan.jpgLee Woolery|Miami Valley Today Troy’s Cole Brogan follows through on a double Monday against Miami East. 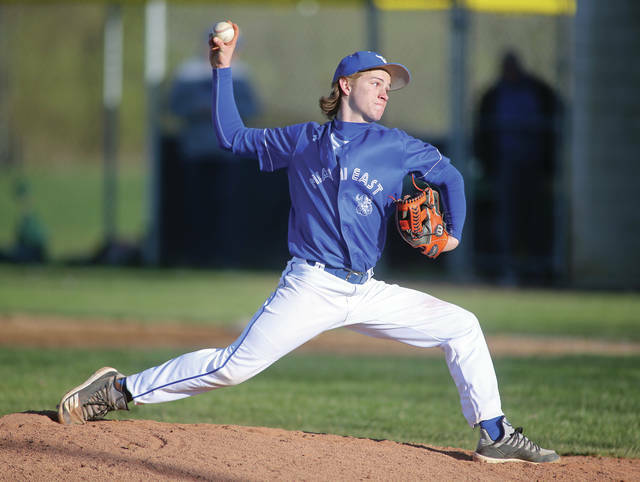 https://www.dailycall.com/wp-content/uploads/sites/30/2019/04/web1_041519lw_me_iangengler.jpgLee Woolery|Miami Valley Today Miami East’s Ian Gengler pitches Monday against Troy. https://www.dailycall.com/wp-content/uploads/sites/30/2019/04/web1_041519lw_me_austinfrancis.jpgLee Woolery|Miami Valley Today Miami East’s Austin Francis lays down a bunt Monday against Troy. https://www.dailycall.com/wp-content/uploads/sites/30/2019/04/web1_041519lw_troy_braedensnider.jpgLee Woolery|Miami Valley Today Troy’s Braeden Snider follows through on a hit Monday against Miami East. https://www.dailycall.com/wp-content/uploads/sites/30/2019/04/web1_041519lw_gagebutz.jpgLee Woolery|Miami Valley Today Miami East left fielder Gage Butz fires to home plate Monday against Troy. 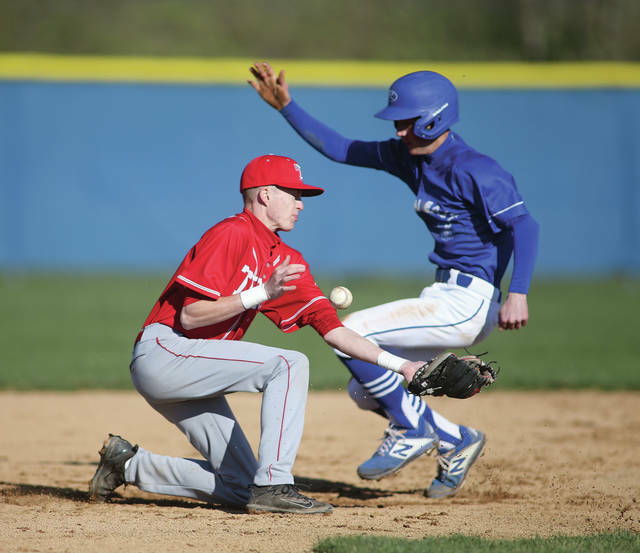 https://www.dailycall.com/wp-content/uploads/sites/30/2019/04/web1_041519lw_troy_kendall.jpgLee Woolery|Miami Valley Today Troy’s Austin Kendall can’t come up with the late throw as a Miami East runner steals second base Monday. 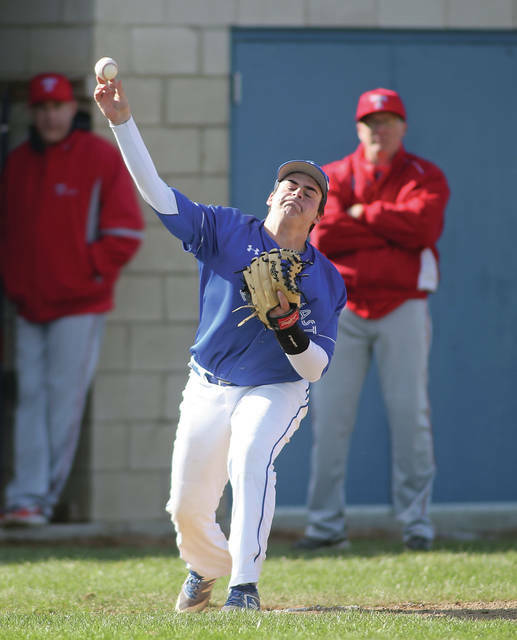 https://www.dailycall.com/wp-content/uploads/sites/30/2019/04/web1_041519lw_me_tylerkirby.jpgLee Woolery|Miami Valley Today Miami East shortstop Tyler Kirby throws to first for an out Monday against Troy. 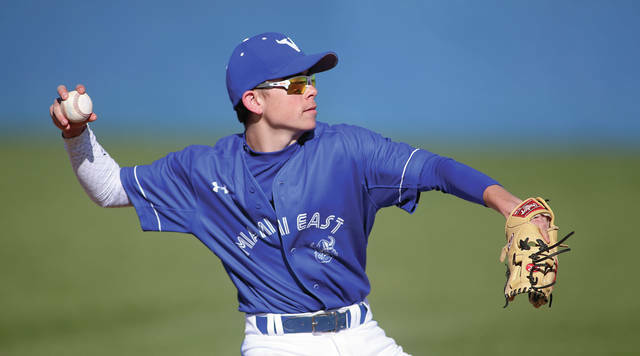 https://www.dailycall.com/wp-content/uploads/sites/30/2019/04/web1_041519lw_me_huntergross.jpgLee Woolery|Miami Valley Today Miami East third baseman Hunter Gross throws to first base Monday against Troy. 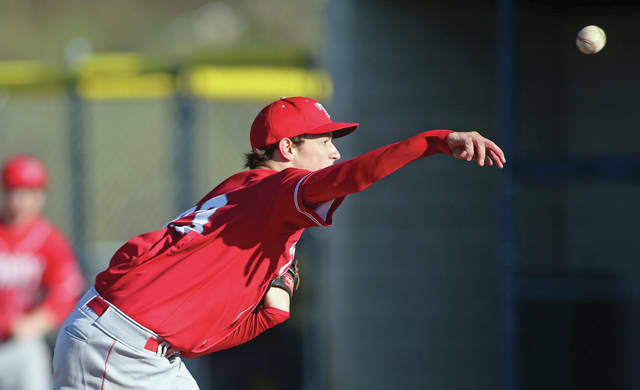 https://www.dailycall.com/wp-content/uploads/sites/30/2019/04/web1_041519lw_me_garrettlemaster.jpgLee Woolery|Miami Valley Today Miami East’s Garrett Lemaster pitches Monday against Troy. 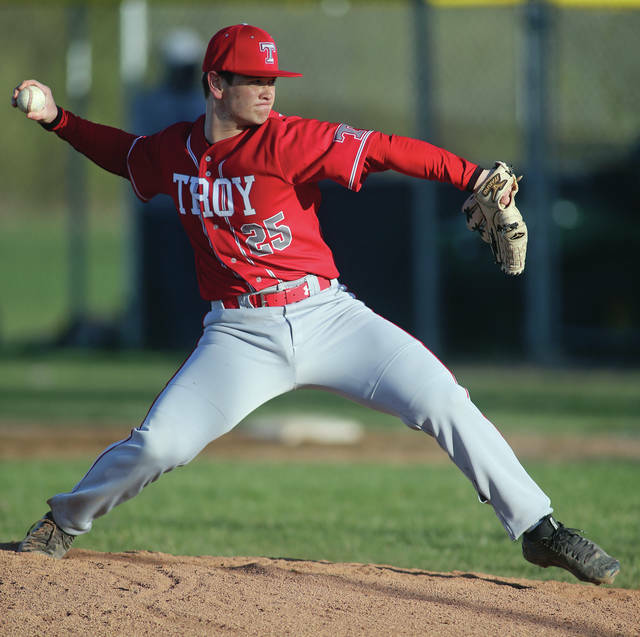 https://www.dailycall.com/wp-content/uploads/sites/30/2019/04/web1_041519lw_troy_bigley.jpgLee Woolery|Miami Valley Today Troy’s Matt Bigley recorded a save in relief Monday against Miami East.